No clamping, mounting, bolting, or attachments of any kind required. 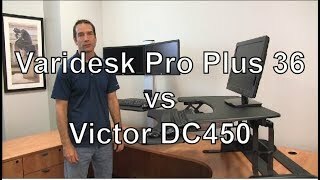 The Victor DC450 transforms any sit-down desk into a sitting OR standing desk. The 28” wide by 23” deep surface is raised up to 20” for ergonomic placement of monitor, keyboard, mouse, telephone and papers while standing. Electric motor design allows easy custom height adjustment with the push of a button. The monitor holder is also height-adjustable with a range of 12.5”. Need a break from standing? Simply push a button and lower the surface down to desktop level. Easy Tap Technology makes operation quick and simple. Press the button once to activate motor and raise desk. Press the button a second time to stop the work surface at desired height. Press button once to lower desk back to seated position. Safety Sensor stops movement when obstacles are detected under the desk. Sleek wood construction and a durable laminate coating provides years of use with a modern style. The sturdy steel base and aluminum tower are built to last. Steel base has felt pads underneath to protect desk/table surface. This standing desk converter rests on top of any desk or table. With no clamping or attachments of any kind to tie you down, the workstation is easily repositioned. 28”W X 23”L X 1 to 20”H. 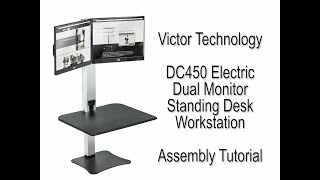 Holds two monitors up to 25" wide and up to 12.5 lbs each. Standard VESA mounting holes are required. Ergonomic Design - Transforms any sit down desk into a sitting or standing desk with the push of a button. Work surface raises up to 20” above the table. Easy Tap Technology - Makes operation of powerful electric motor quick and simple. Press the button once to activate motor and raise desk. Press the button a second time to stop the work surface at desired height. Press button once to lower desk back to seated position. 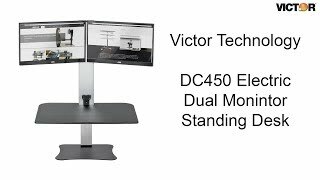 Dual Monitor Capability - Two monitor brackets that are independently adjustable of the worksurface, hold two monitors up to 25" wide and up to 12.5 lbs each. Included at no additional charge. Safety Sensor - Stops movement of work surface when obstacles are detected underneath it. Large Work Surface - Easily place your keyboard, mouse, phone and accessories all on one surface. Practical Design - Sits on top of current desk or table. No clamping, mounting, bolting, or attachments of any kind required. Easily re-positioned. Sturdy Construction - Sturdy, padded steel base prevents tipping and protects desk/table surface. Aluminum tower is built to last. Work surface is made from durable wood with a scratch resistant PVC coating.